When his mother brought him into this world, did she know where he would meet his violent end? Pradeep Edirisinghe, a 44-year-old dairy worker from Sri Lanka, was killed in a violent crash in Northern Southland Friday morning. The Nissan vehicle he was driving collided with a campervan, at a blackspot, which has claimed several more lives in the past, according to a report. The male driver and female passenger, both Italians aged in their 20’s, who were traveling west in a Toyota Hiace van along Two Chain Road, were airlifted to the Otago hospital, the female having serious injuries, police said. Yet another sordid kiwi affair why the *&^%#$#@ authorities haven’t fixed the deadly blackspot. Waikato Police say last night’s fatal crash, which happened about 11.30pm, on Waikato roads was preventable. Canterbury Police have named the teenage passenger who was the victim of a fatal crash on the Tasman Valley Road on the 24 August 2015. She was 18 year old Rebecca Louise Townshend from Dunedin. Canterbury Police have named the victim of the fatal house fire as 38 year old Kara Sibley. Police investigating the sudden death of 58 year-old Mark Lawrence Ivil, recently of Tauranga, who died early this afternoon [25 August 2015] after an incident in the Grand Chancellor Hotel on Hobson St.
Mark Lawrence Ivil, 58, had been accused of living off others’ fortunes for decades to the tune of $4.28 million and was facing numerous charges laid by the Serious Fraud Office (SFO). The mechanic killed at a truck repair yard in Oamaru on Thursday afternoon has been named as 58-year-old Robert George Wallace. The Rail and Maritime Transport Union (RMTU) claims more than two dozen Chinese engineers are most likely being exploited in New Zealand, reported Newstalk ZB. It comes after recent revelations that 20 Chinese workers were being paid $4 by KiwiRail last year, and living in “cramped conditions”. “Pregnant women are among the rising number of homeless people on city streets, with some sleeping rough just weeks out from giving birth,” says Lauren Priestley, an NZME News Service reporter. The following article was posted at NZ Herald [http://www.nzherald.co.nz/nz/news/article.cfm?c_id=1&objectid=11500365] but was removed shortly after publication. The page was cached by a reader and sent to the blog moderators. It was Reprinted on this blog for educational purposes! See blog’s Fair Use Notice. NO copyright infringement intended. By: Lauren Priestley, an NZME News Service reporter. Pregnant women are among the rising number of homeless people on city streets, with some sleeping rough just weeks out from giving birth. National Women’s Hospital Maori midwifery adviser Mahia Winder said she was currently looking after three “streeties” who are pregnant. She has been treating pregnant homeless women at parks, roadsides, brothels and rehab centres for about 10 years – the only one in Auckland doing the job. An Auckland Council report released in 2014 showed there were about 15,000 “severely housing deprived” people in Auckland, but there are no official figures recording the number of pregnant women in the group. Ms Winder said the number of pregnant women might be rising, but only in line with the steady increase of homeless people year on year. And the main concern for the soon-to-be-mums is not usually the impending birth, but survival. “Usually having the baby is probably about the last thing on their minds. There’s more stress in the fact they’ve got nowhere to live and are usually cold and hungry and broke and often have addiction problems. The lack of emergency housing set up for pregnant homeless women in Auckland was part of the issue, Ms Winder said. She said new mothers also had difficulty finding housing or emergency accommodation once they gave birth. Emergency housing provider Danielle Bergin, of Island Child Charitable Trust which usually takes in homeless families, said living on the street or in temporary accommodation was particularly hard for pregnant women. She was currently housing a mother with a 4-month-old baby who had been pregnant when she applied for a home. About a year ago, Ms Bergin took in a 28-year-old woman who was heavily pregnant. The woman had the baby and then was forced to return to the emergency housing room in Pt England. “Here we are a year later, has anything changed? I’m finding it so hard to get the houses now. For families or mothers with babies I’m finding it incredibly hard, there are such long delays. “There are some serious delays in people having their applications completed and they think they’re on the [social housing] waiting list but they’re not. Lifewise service manager Corie Haddock said the sector was seeing an annual increase in homelessness and marginalised groups, including pregnant women, were the hardest hit. The organisation was currently looking after one pregnant woman and has helped women who were more than 8 months’ pregnant in the past, he said. It was “hard to quantify” whether more homeless women were becoming pregnant or more pregnant women finding themselves without a home, he said. “I think they all want to be good mothers so that pressure of not having somewhere safe and secure to live and for their baby to live must have a detrimental impact on them. “[We help] anyone and everyone that comes through the door needing support. We’ve had situations in the past where we’ve had young women that are pregnant and I guarantee we’ll have situations in the future as well.” – NZME. Copyright the author and/or the relevant media/ syndicator. DO NOT allow learner trees on State Highways! Another Fatal Crash in Bay of Plenty of Deaths? A fatal crash has occurred on Oamaru-Alma Road in Oamaru where a truck and car collided killing the driver. Police have released the name of the young woman killed in a fatal truck crash in Birkenhead yesterday. She was Jane Lee Devonshire, aged 19 years old, of West Harbour. An investigation is underway in Taupo following the death of a three-year-old boy, police said. The boy was admitted to Taupo Hospital with critical injuries at approximately 3pm yesterday afternoon (Monday, 10 August). Preparations were underway to transfer him to Starship Hospital but he died last night before that transfer could occur. Police have confirmed the 58 year-old man who was killed in avalanche yesterday was Roger Greville of Sydney, Australia. The cause of his death is still unknown and has been referred to the coroner. A post-mortem is scheduled to occur this morning, police said. At 11.38pm on Saturday, 8th August 2015, a serious motor crash occurred on Farndon Road, Clive, police said. A 58 year-old man, believed to be an Australian national, was killed by an avalanche near the Devil’s Staircase (!) at around 2.45pm today (10 August 2015). The cause of his death is unknown at this time, and it has been referred to the coroner, police said. Police also said they are working to advise the next of kin. No further details are available at this time. A man was killed after a car left the road in Puke-kohe just before 7am today, police said. The murder victim found at Taieri Court on Thursday 6 August, 2015 has now been formally identified as 26-year-old Samuel Peter Culling, is also known as Samuel Whatuira and Samuel Badawi (!) of Palmerston North. Police are “investigating” the death of a child in Onehunga on Friday morning. They said they were awaiting further test results to establish how the child died. “Police still have no clue what killed the young girl. The woman who had called police was taken to hospital for treatment of some minor injuries,” according to a report. All media queries relating to the death in Onehunga should be made directly to the Auckland City District Communications manager Noreen Hegarty. That’s very useful indeed! You can’t have “news salvation” unless you go through the me-dia. 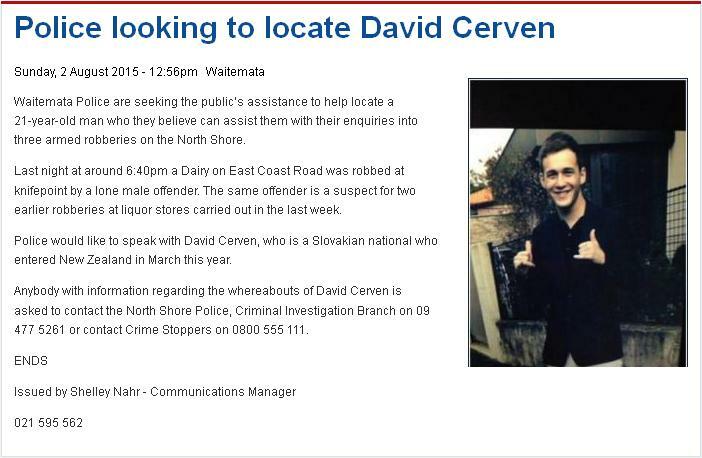 Slovakian national David Cerven, 21, was shot dead by Police assassins in Myers Park, Auckland, Sunday evening at about 7.45pm. The victim came to New Zealand in March this year, police said. Police have alleged that the victim had robbed a Dairy at knifepoint on Saturday night and that he was a suspect in two earlier robberies at liquor stores over last week. The blog moderators are advised by “police insiders” that the victim did not carry a firearm and that the police team who assassinated him was fully aware at the time that he had NO firearm in his possession. Auckland City District Commander, Superintendent Richard Chambers has so far failed to provide any evidence that the alleged suspect was indeed carrying a firearm, or how the victim could have possibly come into possession of one, other than the one police might have planted on him, in a space of a few hours, immediately after he had allegedly robbed the Dairy at knifepoint on Saturday. The victim could have easily been disarmed by the police. Failing that, the police marksmen could have easily immobilized him by shooting him in the leg, or arm, instead of shooting to kill. News of a “serial pooper” relieving himself in police bagpipes, and wiping himself with their new tartan, comes shortly after the police announced that the New Zealand Police Pipe Band was setting off in its new tartan to compete in the World Pipe Band Championships in Glasgow on 14-15 August. The new tartan was piped in by Pipe Major Emmett Conway, appropriately playing the air Macleod of Mull, at the ceremony at Police National Headquarters. Police file. The band’ new tartan, which replaces the King George VI tartan and meant to pay tribute to its Police heritage, is the McLeod Centenary tartan. The new tartan was piped in by Pipe Major Emmett Conway, appropriately playing the air Macleod of Mull, at the ceremony at Police National Headquarters, police said. Dog bites are causing increasing numbers of people to be hospitalised every year, according to a new study. Two male tourists were attacked at the Vagabond Backpackers Hostel in Christchurch. Blood covers the driveway at a central Christchurch backpackers where two tourists were attacked by a group of people. The tourists were attacked by up to eight people in the driveway of the Vagabond Backpacker Hostel on Worcester St between 2.30am and 2.45am on Saturday. Both men have been admitted to hospital. One suffered a broken jaw, while the other has serious eye injuries. The tourists were believed to be from France. A Belgian tourist who is staying at the hostel, said he was asleep last night during the attack but had heard what happened from other backpackers. He said a French man had been waiting for a taxi outside the hostel when a group of locals walked past. “The guy was getting harassed and yelled and his mates came out [of the hostel]. They tried to help him, but I think they didn’t helped. Another French tourist said “a lot of people were talking about it this morning” at the hostel. Two French tourists have been harassed by strangers as they slept in their campervan at Caroline Bay. Francois* and Fanny* spent eight months travelling around Australia without incident. They arrived in Queenstown on Tuesday and stopped in Invercargill and Dunedin before making their way up to Timaru on Saturday. Everything went smoothly until they parked their campervan at the Timaru freedom camping spot overnight on Sunday. “Only here we have a problem,” Fanny said. Three police chases in Northland ended with one patrol car sliding off the road and rolling, police said. Police said the first chase began at 12.25am on Sunday when a car failed to stop for officers on Western Hills Drive in Whangarei. The chase was abandoned for safety reasons but police began chasing the car again after it was spotted in Hikurangi, 20 minutes north of Whangarei. The driver fled on foot at Waiomio Rd, 36km north of Hikurangi, but he was soon located by a police dog handler. At 1.10am, there was another pursuit of a car stolen from Marsden Point, on the coast south of Whangarei. Credit: MAARTEN HOLL/The Dominion Post. The new police car came to an early end as the driver wrapped it around a streetlight in central Wellington August 2009. Figures issued to The Dominion Post under the Official Information Act show that 734 police cars crashed in 2009, including 61 that crashed while pursuing speeding vehicles… About 100 police cars were written off in the five years to January 2010 at a cost of more than $3 million. In the U.S., more than 5,000 bystanders and passengers have been killed in police car chases since 1979, and tens of thousands of others were injured as officers repeatedly pursued drivers at high speeds and in hazardous conditions, often for minor infractions, a USA TODAY analysis shows. In the state of Arizona [pop: ~ 6.8 million,] some 354 people were killed in police chases between 1979 and 2013, about 3 percent of the 11,506 deaths nationally, according to the report. Based on information acquired from various sources, the blog moderators believe that the rate of kill in police chases is probably higher in New Zealand than in the U.S.
Do the authorities cook the casualty figures? At least 11,506 people, including 6,300 fleeing suspects, were killed in police chases from 1979 through 2013, most recent year for which [National Highway Traffic Safety Administration] NHTSA records are available. That’s an average of 329 a year — nearly one person a day. But those figures likely understate the actual death toll because NHTSA uses police reports to determine if a crash was chase-related, and some reports do not disclose that a chase occurred. Kansas, Michigan and Minnesota state records all show more chase-related deaths than NHTSA shows for those states. The number of innocent bystanders killed is impossible to pinpoint because hundreds of NHTSA’s records fail to show whether a victim was killed in a car fleeing police or in a car that happened to be hit during a chase. Analyzing each fatal crash, USA TODAY determined that at least 2,456 bystanders were killed, although the death toll could be as high as 2,750. The newspaper found that 55% of those killed were drivers fleeing police. They ranged from armed-robbery suspects to a 10-year-old boy chased as he drove a pick-up truck 85 mph on a county road before hitting a tree, killing himself and his 7-year-old passenger.